Cross-city lines are all the vogue. London has Thameslink, several Underground and Overground Lines and will shortly have Crossrail. Liverpool has the Northern Line. Leipzig has a cross-city tunnel. Birmingham has the Cross-city Line. So why shouldn’t Aberdeen propose Aberdeen Crossrail? This Google Map shows Aberdeen. The white blob on the map above the City, which is Dyce Airport. 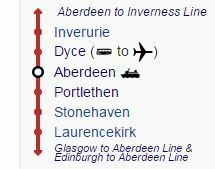 The Aberdeen to Inverness Line links Dyce Airport to Aberdeen station in the City. The Edinburgh to Aberdeen Line and the Glasgow to Aberdeen Line share a common route South from the City as far as Dundee. The shared line South runs along the coast, through a succession of towns, some of which have stations. The Aberdeen Crossrail plan is to link the Aberdeen to Inverness Line to the shared line to the South and create a frequent service along the route. That is a standard philosophy for a cross-city line. This diagram from Wikipedia, shows the proposed line and the stations. It is a simple plan and a simple route with one big difference to most of the other proposed or built Cross-city lines – There is no expensive central tunnel. It is almost solely a marketing concept, based around existing services. Wikipedia says this about Implementation. Transport Scotland announced in March 2016 that the scheme will go ahead as part of a wider timetable recast in 2018. The new service will run between Inverurie & Montrose, serving all existing intermediate stations and one at Kintore from 2019. The Aberdeen to Inverurie section will then have a 30-minute interval service in operation. 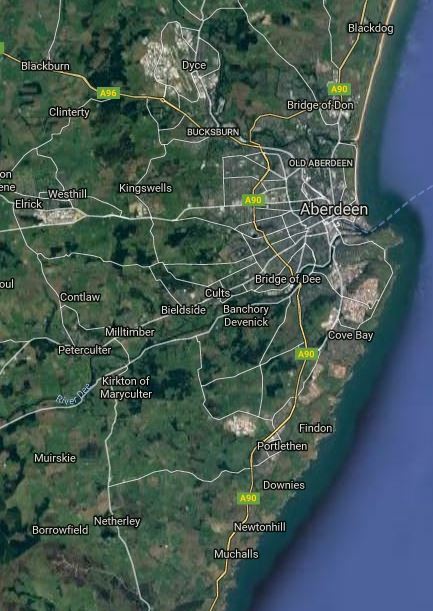 Infrastructure enhancements on the Aberdeen to Inverness line (including the redoubling of track from Aberdeen to Inverurie) are also scheduled to be completed by this time, as part of a £170 million route upgrade project. All it needs is to add lots of stations. It is a project manager’s dream to build, as once trains are running and the pattern of passenger use develops, the authorities can add trains and stations, as needs and the budget dictate. The nearest cross-city lines in concept to Aberdeen Crossrail are probably the North London and East London Lines of the London Overground, where two cross-city lines were created from some very tired track, stations and trains, by refurbishing the first two and replacing the trains. Like the London Overground, Aberdeen Crossrail is updating the route. Aberdeen’s current trains are probably better now than the travelling urinals, that the Overground inherited from Silverlink. One thing that I think Aberdeen Crossrail will need is a Turn-Up-And-Go frequency of four trains per hour (tph), that has been used so successfully on the Overground and Merseyrail. In A Look At New Station Projects, I’ve found several. Kintore is a planned new station. Aberdeen Airport is a possible new station. Aberdeen Exhibition And Conference Centre is a possible new station. Kittybrewster is a possible new station in Aberdeen. Girdle Ness is a possible new station in Aberdeen. Newtonhill is a possible new station South of Portlethen. Girdle Ness could be a station in a spectacular location on the coast. Aberdeen station in the top left corner and Girdle Ness is the lower of the two promontories on the right. 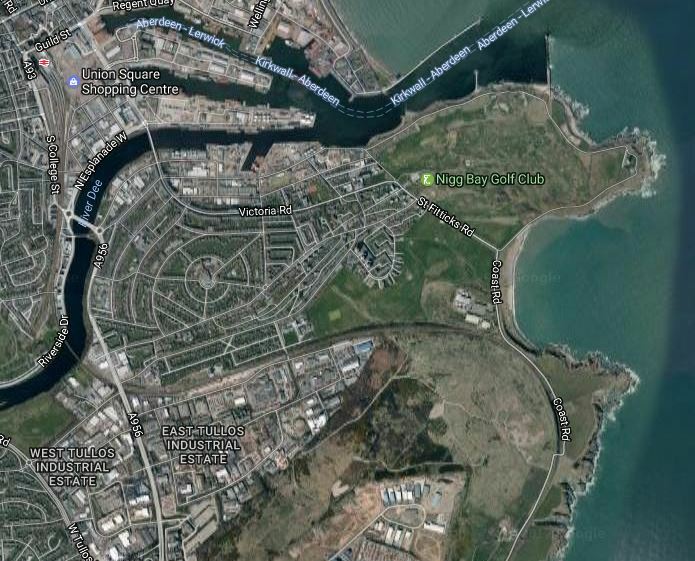 What looks like a wall curving behind the promontory is in fact the railway crossing across the city and the turning South to Montrose, Dundee and Edinburgh. If an average architect couldn’t make good use of this location, then they’re not even average. This proposal is very likely to be a success, but I feel that it needs to offer a frequency of four trph.